Drift away from city shores on a stand up paddleboarding adventure. Discover the scenic route to the pub, float to islands just beyond the bustle of London, or hone your skills with a paddleboarding lesson. We have SUP Sessions available on Thursday and Friday evenings as well as on most weekends from Sunrise to Sunset and we run a weekly SUP Club on Tuesday evenings. Glide along scenic waterways on a stand up paddleboard. Swap city life for wildlife. Paddle to the pub for a sundowner. Drift beneath the twinkling night lights of London. Socialise and enjoy the simple life. Stretch yourself on a paddleboarding course or one-to- one session. Want to paddle regularly? Join our SUP Club to get reduced rate sessions. Cast off, get fit and discover water-bound adventure on the doorstep. Our stand up paddleboarding trips are a unique and sociable way to leave city life behind and explore the beautiful backwaters around London. Soak up the serenity of sunrise, see the sunset over the water, take the scenic route to a riverside pub, or drift along under the twinkling night lights. Want to work your core muscles, meet like-minded friends and master the basics of stand up paddleboarding? Our small group taster sessions are a fun-packed way to take to the water and try a new skill. Under the wing of our friendly, expert instructors you will get to grips with paddling techniques on a micro-adventure along the River Thames. During the session you’ll learn about water safety and the rules of the river, launching and landing and the basics of forward paddling and turning. If you enjoy this taster session then you'll need to take a SUP Wise lesson or SUP Wise Improver Lessons to join our SUP Social and member trips. Dates: Click on the BOOK NOW button to see available dates and times. Beyond basic stand up paddle skills, the course covers stand up paddle safety, boards and equipment, safe locations, paddle practice and stroke correction and techniques to paddle with confidence. Want to work your core muscles, meet like-minded friends, master the basics of stand up paddleboarding and bring man (or woman's) best friend? Our small group SUP with your Pup sessions are a fun-packed way to take to the water with your dog and learn a new skill. Slow down and see the city in a different light. Explore a scenic stretch of the River Thames, brush through nature and discover the wild side of the waterways in the golden light of dawn or dusk. Our twilight stand up paddleboarding trips are a sublime way to wind down before drifting back downstream to your start point and an optional pint at a riverside pub to finish. Whether you’ve only just completed a SUP Wise Improver course, or are a seasoned pro, this easy-going, circular trip is suitable for you. Our friendly instructors will provide all the kit and take you through the basics before you cast away on your adventure. Head torches or bike lights are useful for the sunset SUP sessions. Don’t squander the last part of the weekend: the perfect way to spend a lazy Sunday afternoon is on the water. 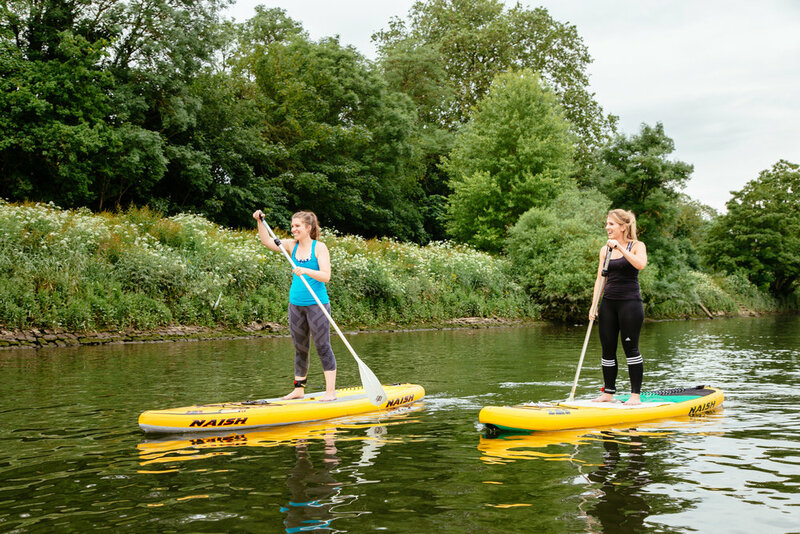 Hit the Thames on a stand up paddleboarding adventure that will take you along a scenic stretch of the river on the outskirts of London. Love to SUP or simply want to try? Join our SUP Club for regular sessions, discounts on our SUP Lessons and social trips and access to SUP Club trips further afield. This year we have plans for SUP Picnic and Bubbly trips, wild camps, racing as well as for Summer Solstice, Spooky SUP and SUPing Santa sessions. Definitely a great place to start learning paddle boarding, great instruction, great setting and fantastic fun. We've come away with a taste for more. Highly recommend the company for any of their activities. It was beautiful way to spend a few hours, saw bits of the river I've never seen up close before and various wildlife! Thank you I will be back!